It was a beautiful May day when I set up my easel at the edge of the village, exactly where the cobblestone road ends and merges into a sand path. Lined by tall, slender poplars in fresh green, the path slowly lost itself in the distance. In former times carriages rumbled over it, today it belongs to the ‘long-distance hiking trail E1’ – a route that traverses Europe from the North Cape in Norway to Sicily. A tempting idea: just go! Neither bicycle, nor car, nor aeroplane, only on foot with a light rucksack on my back. Every night different accommodation, because a tent and sleeping bag would be too heavy for me. A carriage, I had once read, took six weeks to travel from Dresden to Hamburg in around 1700. It would take me several years to walk from the North Cape to Sicily! “That’s a nice hobby you have,” a voice suddenly reached me from behind. Three women in practical leisure clothes and with funny sun hats as headgear stood next to me, I hadn’t even noticed them coming. One wore binoculars around her neck, the other held a flower identification guide in her hand and walking poles dangled from the wrists of the third. Three real hikers. “Landscape painting seems to be on the rise again,” continued the ‘binocular woman’ confidently. “Like hiking appears to as well,” I agreed with her and scrutinised her sturdy shoes. “Where are you off to today?” – “To Schwarzenbek and then by train back to Hamburg.” – “You’ve probably had coffee at Enno’s at the manor?” – “Yes, that was quite enchanting. The rose garden is so beautiful,” enthused the ‘flower woman’, “we sat in the sun by the pond and...” – “Yes, then we won’t keep you any longer,” the third one interrupted her, “we must continue, the way is still long. Come on!” But then we chatted for a while about the individual crane in the forest, the deer that can be observed so well from raised hides and about the great usefulness of good hiking boots. When the three hikers finally set off, I would’ve liked to have accompanied them, exchanged the easel and my painting pad for a camera, binoculars and a flower guide. 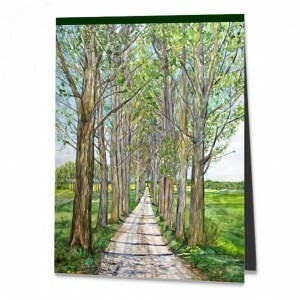 But when they had disappeared into the distance and only the poplar avenue lay in front of me, I immediately enjoyed standing alone with my easel on the side of the road again. The rustling of the leaves and the chirping of the birds became louder, my heartbeat calmer, the flow of thoughts slower – and finally only the next brushstroke seemed to matter.